I installed Lion on my home MacBook Pro the day it came out. It’s an old 17 inch that I use mostly for testing and mucking around, and don’t mind if something goes wrong. My critical data is on a newer MacBook Pro 15 I use for work or on external drives. As with every new OS, I’m eager to start playing with it straight away but I’m also concious that it could cause some issues or incompatibilities with the software I use. And there’s always the possibility of a few bugs that made it past testing. 1 So I always install them on a non critical computer first. With Mac OS X Lion, everything went well and only one application had issues 2, so after a few days of testing I decided to install Lion on my work computer. The only software I did not install on my personal machine is Microsoft Office, as I do not personally own a license for it and I don’t use it for anything other than work anyway. The actual installation of Microsoft Office for Mac 2011 went well. Although it did feel weird installing software from a disc after going through the Mac App Store and disk images. After it finished it had to download a bunch of updates, which is normal when installing from discs. The interesting part happened when it finished. I knew Office installs a bunch of fonts as part of the process, so I opened Font Book to check there weren’t any duplicates and sure enough, there were about 10. One thing I found strange is that most of them were fonts you’d assume Microsoft knows would already be installed by default on any Mac (like Arial, Times New Roman, Verdana, Trebuchet, and others), so why include them on the installer? Apparently they don’t know Macs come with fonts (or don’t care). But what I found really absurd is the actual versions of the fonts Microsoft includes. Take Trebuchet for example. The version that Microsoft installs as part of Office for Mac 2011 is version 1.26 (copyright 1996). However, the version that comes preinstalled on the Mac is version 5.0 (copyright 2006). 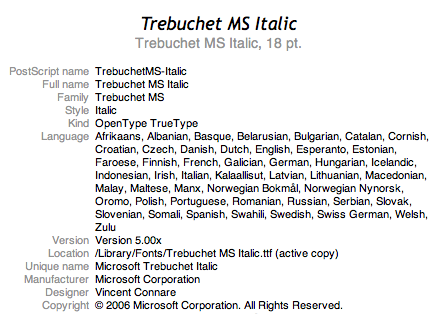 The best part is that the manufacturer of Trebuchet is Microsoft. So, Apple uses a newer version (by 10 years apparently) of a Microsoft font than Microsoft themselves. Does this seem idiotic to anybody else? Trebuchet version installed by Apple. 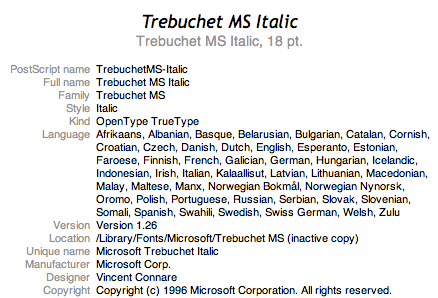 Trebuchet version installed by Microsoft.